Keep in mind that there are differences of opinion about these matters, which we will both explain and comment on when the time comes. First, though, here is a summary of the key points. To serious cooks, the most important favorable point about induction cookers--given that they are as or more "powerful" at heating as any other sort--is that you can adjust the cooking heat instantly and with great precision. Before induction, good cooks, including all professionals, overwhelmingly preferred gas to all other forms of electric cooking for one reason: the substantial "inertia" in ordinary electric cookers--when you adjust the heat setting, the element (coil, halogen heater, whatever) only slowly starts to increase or decrease its temperature. With gas, when you adjust the element setting, the energy flow adjusts instantly. But with induction cooking the heat level is every bit as instantaneous--and as exact--as with gas, yet with none of the many drawbacks of gas (which we will detail later). Induction elements can be adjusted to increments as fine as the cooker maker cares to supply, just like gas, and--again very important to serious cooks--such elements can run at as low a cooking-heat level as wanted for gentle simmering and suchlike (something even gas is not always good at). Someday, perhaps not so many years away, the world will look back on cooking with gas as we today look on cooking over a coal-burning kitchen stove. We have already mentioned that the stovetop stays cool: that means no burned fingers or hands, for you or--especially--for any small children in the household. 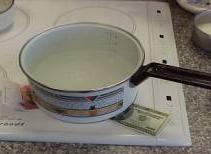 (In the image at the right, you can see a pot boiling water on an induction unit while a dollar bill between the pot and the cooktop surface is unsinged.) And for kitchens that need to take into account special needs, such as wheelchair access, nothing, but nothing, can beat induction for both safety and convenience (see the paragraph farther below). Moreover, gas--induction's only real competition--has special risks of its own, not all of which are as well known as they perhaps should be. While the risk of a gas flame, even a pilot light, blowing out and allowing gas to escape into the house is relatively small, it does exist. But a much bigger concern is simply gas itself, even when everything is working "right". Use any web search engine and enter the terms gas health risk cooking and see what you find (really: do try it right here); if, for example, you visit the Gascape web site, you may never again want to even enter a house with gas laid on (take some time to really poke around on this site--you may be shocked). And, of course, all combustion releases toxic carbon monoxide. It is an obvious but still very important fact that induction cookers are powered by electricity. Not every home actually has a gas pipeline available to it--for many, the only "gas" option is propane, with the corollary (and ugly, space-taking, potentially hazardous) propane tank and regular truck visits. But everyone has clean, silent, ever-present electricity. On the other hand, if you have a significant quantity of non-ferrous cookware that is not terribly expensive, you can replace it--possibly with much better stuff!--as part of the process; cast iron is by no means "spendy" cookware. If you have ever seen the inside of a real restaurant kitchen, you will surely have noticed that most or all of the cookware is either cast iron or nice, shiny stainless steel (even when they are still using gas for their cooking). Steel is most cooks' preferred cookware material for many good reasons we discuss elsewhere on this site (see the link below--and recall that enamelled steel cookware also works beautifully on induction. As we noted elsewhere, technology to allow use of any metal cookware--even copper and aluminum--is in the pipeline, but there are definite problems with getting sufficient power levels with that technique, so it will likely be many years before units with it start showing up in the mainstream (if they ever do). So, for now, the need for ferric cookware does remain. This is not a valid negative--but we list and discuss it here because there are so many falsehoods and misunderstandings floating around on this matter. As we clearly showed, with hard numbers, induction cooking units are not merely as powerful as even "pro" gas ranges (residential "pro", that is), they are almost invariably much more powerful. (And that's using conservative figures for both gas and induction efficiencies.) To recap, a top-line (and top-price) so-called "pro" home gas range might have burners each rated at 15,000 BTU/hour or, in a few cases, as much as 18,000 BTU/hour--but that is only about 2.1 to 2.5 kW for induction elements, and even the most modest cooktops have at least one element of at least 2.4 kW (and many have elements up to 3.6 or 3.7 kW!). Any concern over the adequacy of the "cooking power" of induction units is simply silly. Induction itself is a noiseless process: the energy fields are generated by electronic equipment, which is silent. But even efficient electronics generates some heat. Whether the amount of heat generated can be dissipated "passively" (just by radiation and natural air flow, still silent) or requires a small fan to augment the air flow depends in good part on how tightly a given maker has packed how much power into how much space--some units have fans, some don't. But even on those with fans, one, the fan does not necessarily run all the time--usually just when the unit is running multiple elements at high settings--and two, such fans are normally pretty soft-sounding. There can also an occasional very soft "tick" sound, as the power controller cycles the elements on or off to keep the element power steady and stable. Cookware of solid cast iron, including enamelware, is not subject to such issues; and clad cookware of the top lines should not be. If the electricity supply to your home is interrupted, you will be unable to cook; gas supplies can be interrupted, too, but such interruptions are normally somewhat less likely than electricity interruptions. If the electricity where you are frequently goes out for hours at a time, the loss of cooking ability may be an issue for you. Most people living in such circumstances will have provided themselves with a backup, such as a propane-powered emergency generator--but if that's you and you have no backup, factor the matter into your decisions. For those to whom charring such items as peppers in an open flame is important, the lack of such a flame is a drawback. (It is, of course, one shared with all non-gas cookers.) But nowadays, most good ovens--gas certainly, but probably even electric--can do an acceptable job of charring food. Energy-cost differences are hard to reckon because the prices of gas and the price of electricity these days are highly volatile, even relative to one another (the DOE--the U.S. Department of Energy--reports that between 1999 and 2008, the national annual average residential natural gas price more than doubled), and vary considerably from locale to locale even on the same day at the same hour (and, of course, by season, too), sometimes by as much as a 3:1 ratio. But in any event, it is not a really large factor: according to the DOE (Table A.4), cooking accounts for only about 2.7 percent of an average home's energy use--and that use includes ovens, toasters, microwaves, and whatever else, not just stovetop cooking. 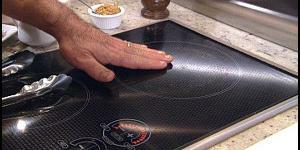 The difference in cost for various cooktop energy sources is at most on the order of a couple of dollars a month. It's hard to say that induction units are "comparable" to, much less cheaper then, gas cookers when their prices start at well over a thousand dollars: nonetheless, we will say it. The reason we do is because one needs to be careful to compare apples to apples, and the conventional 30-inch slide-in kitchen stove is an orange in this analogy. It is not always true that "you get what you pay for", but it is always true that you don't get what you don't pay for. An induction unit is so clearly superior, in so many ways, to any other form of cooking that it is hard to exaggerate the differences. One can say that a Chevy and a Rolls Royce are both "cars"--vehicles that take a given number of passengers from Point A to Point B--but there are valid reasons for the difference in their prices. Moreover, a cooker--ordinary, fancy gas, induction, whatever--is a very long-term investment. The cost difference between a simple, inexpensive plain kitchen stove and a decent or better induction unit is not much when averaged out over the likely lifetime of such a unit. Consider: right now (2/10), Consumer Search's preferred gas range with convection oven costs about $800; an induction-top range with convection oven (and the warming drawer the other lacks) can be had for $1,770. Yes, that's quite a difference; but amortize the $970 difference over the useful lifetime of such an appliance and it's maybe a buck a week. But back to that "apples to apples": if one compares prices for induction units with those of comparable power and quality gas cookers, they are more than competitive. That $800 mentioned quickly doubles or trebles--and just for a cooktop, no oven--when one gets into the high-end gas equipment that is the only kind of gas cooking comparable in power to induction. For a top-line four-gas-burner-top range with 18,000 BTU/hour burners, one sees prices very close to $4,000, not the $800 mentioned above for an ordinary kitchen range. So if $1,770 is a lot more than $800, it's an even greater lot less than $3,900. Apples, oranges: take care. Cooking vessels at the extremes of size--the very small and the very large--occasionally raise issues. 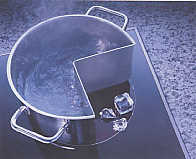 Because the auto-detect feature that all induction units have is meant to assure that things from cooking implements (such as metal tongs or spoons or ladles) to jewelry (rings or bracelets) will not activate an element, the detectors are often set rather conservatively, so much so that on some units very small pots or pans will not be detected (the usual minimum pot base size for activation is from 4 to 5 inches, depending on particular unit.) But that is scarcely a major issue: if you really must have such a pot--say "a butter warmer"--there are accessories available that make it easy. At the other extreme--things like griddles or fish poachers that are well over 12 or 14 inches in at least one dimension--also present issues; but we list this as "neutral" because those issues are not substantively different from induction to, for example, gas. An induction element heats a cooking vessel placed on to the width of the element--just as with, for example, a gas burner. 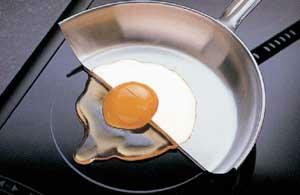 If one places a 12-inch-diameter skillet on a 9-inch induction element, the actual heat generation will take place in a 9-inch-diameter zone in the pan bottom; likewise, if one places the same skillet on a same-size gas burner, so also will the heating be limited to the size of the burner diameter. Heated cookware will do one of two things, depending on its construction (see out page on cookware for more detailed explanations): vessels designed to accomodate rapid changes in cooking temperature, such as clad stainless-steel cookware, will be correspondingly rapid in spreading heat throughout their total cooking area; vessels intended for even-temperature cooking, such as cast iron (enamelled or not), will be slower to achieve temperature equilibrium, but once well heated will hold temperatures pretty even and constant across their total cooking area. On any cooking technique whatever, heat is only delivered or supplied within the diameter of the zone--gas burner, induction element, heater coil, whatever. Any vessel nontrivially larger than that zone will invariably be a little less hot at the outer edge of the cooking zone. That is a fact of life independent of the cooking technology, and is thus neither a plus nor a minus for induction compared to other methods. Actually, though, in the present state of the art induction is gaining the clear advantage as "zoneless cook-anywhere" induction cooktops--meaning that the entire surface is a cooking "zone"--become more and more prevalent. On such units, an "element" is defined by the size and shape of the cooking vessel placed on the surface: the entire cooktop is underlain by a very large number of small "micro-elements", and those micro-elements lying under a vessel ware what is activated by its presence. Grills, griddles, fish poachers, super-large skillets--all are heated uniformly merely by being placed anythwre on the cooktop. This is not guessing or "futurology": units that actually work that way are to be had right now from well-known makers (but, regrettably, for unknowable reasons, so far not yet in the North American market). The GardenWeb posters tend to be everyday folk; the usenet posters tend to be more various. In any event, using these links gives you a set of results over which we have no control at all, so it's as unbiased as it gets (the selection is unbiased: many of the posters will be highly biased one way or another--see the text immediately below for examples of what we mean). We used to have here a little selection of cracked-pot postings, with our explanatory comments appended, but there's really little point to it now. Once, when so little was generally known about induction in North America, cracked pots could get away with posting ignorant (and usually snotty) nonsenses about the inferiority of induction and the supposed vast superiority of gas--but those days are gone now. Not that there aren't likely to still be a lot of cracked pots out there--this is the human race we're talking about--but hard, factual data is now readily adduced. One could, for example, if given to being tediously supererogatory, compile a long laundry list of top-rank chefs and restaurants that use, and extravagantly endorse, induction equipment, as a sort of "Take that!" to those who insists that "the pros" use nothing but gas; but there would be no point except to prove a willingness to scan a lot of web pages, because so very many top chefs and restaurants would make that list. Although this site is about the clear superiority of induction to any other method of cooking, we really have tried to give as balanced a picture as possible. If it seems to you, after reading this page, that we have skewed toward the favorable, that is only because induction really is immensely superior. Its sole consequential drawback is its inability to work with certain kinds of cookware--which is not an inherent flaw, because it works with the very best--but which can be a drawback if you are at present heavily invested (whether in a dollar or in an emotional sense) in incompatible cookware.